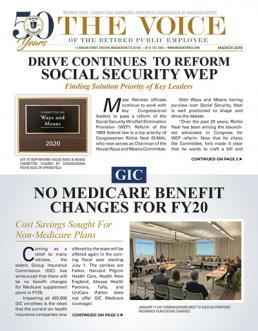 Filed by Congressmen Kevin Brady (R-TX) and Richard Neal (D-MA), HR711 would repeal the WEP law and create a new national Social Security formula to jointly calculate one’s lifetime public and private sector work history. The bill comes as the result of coordinated efforts between Mass Retirees, Texas Retired Teachers Association and the Ohio Retired Teachers Association. “No group of elected officials knows the WEP better than Richie Neal and the Mass. Delegation. They have been out front on this issue for years and we can’t thank them enough for their support,” said Association Legislative Director Shawn Duhamel. “In order for HR711 to move beyond the Ways and Means Committee, we need to demonstrate unanimous support for the bill from our delegation, Texas and a few other key states. As senior members of the House Committee on Ways and Means, Congressmen Brady and Neal are uniquely situated to advance HR711 beyond the Sub Committee on Social Security. What remains to be seen is whether or not a public hearing will be held prior to the bill being favorably released. Since the WEP’s creation in 1985, no bill to repeal or reform the law has advanced beyond the Committee level in either the House or Senate.